Sunday, 16th October, saw the annual CUPC Novices tournament - a chance for any new or previously unseen players to win a trophy and make themselves noticed. 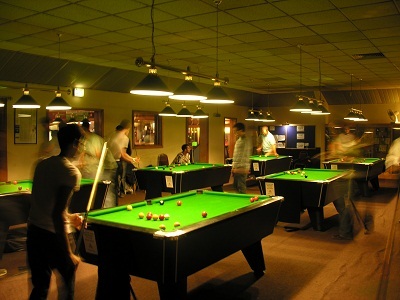 The tournament, held at the Cambridge Snooker Centre, saw a field of twenty (up from just nine the previous year) take part in a high-quality competition. Congratulations go to Yunqing Guan who overcame Jonathan McKenzie in a tense rematch of a group-stage game that had finished as an easy 3-0 victory to Yunqing. This time, however, Jonathan led 3-2 and had a tricky black to take the trophy, but could only jaw it. A nerveless 3-ball finish from his opponent saw the match go to a deciding frame, in which Yunqing prevailed. How much it meant to him was clear in his celebration! Congratulations must go to him, his opponent in the final (who showed excellent composure to win his last 16, quarter and semi-final in deciding frames) and to all those who took part. 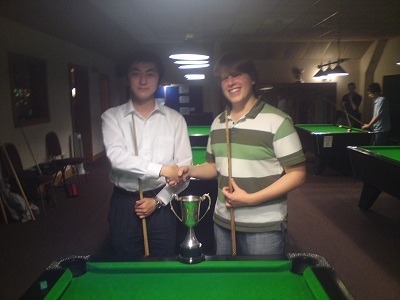 It was, by common agreement, one of the highest quality Novices Tournaments seen for many years. Yunqing and Jonathan before the final. The top two novices from each group qualified for the knockout stages. The top novice from each group, together with the best second-placed novice (Alistair Sloan), went straight into the quater-finals, while the remaining 4 players, had to play a Last 16 match. The first round of the tournament had a group format. 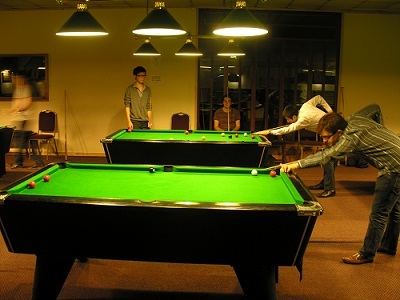 Players were split up into five groups, each with one university player (marked 'Uni') and four novices, before each player played three frames against every other player in their group. The top two players in each group excluding the university player would progress through to the knockout stages. Should two players finish tied on frames won, their relative positions would be determined by their performance against the Uni player in their group. Yunqing and Francis. Several novices display their speed around the table.